Could your organization benefit from videos like these? We are looking for a group to partner with us for a pilot project. Learn more about our Nutrition & Wellness Video License on our website here. WHAT IS THIS VIDEO ALL ABOUT? Are you hounding your kids or significant other to eat fruit more often? Do you have good intentions of eating more fruit yourself only to find yourself tossing out rotting fruit in your fridge drawer? There are 3 surprising reasons that you or your family may be failing to eat enough fruit. Here they are and what you can do about it. If you have placed your fresh fruit in your fridge fruit drawer hidden away, chances are you and your kids won’t see them. What we see is often what we eat. The first thing you will see when you enter my kitchen is a beautiful fruit bowl on my island that seduces you into the kitchen. Since it is bursting with color and displayed where everyone can see it, fruit is much more likely to be consumed. For food that must be in the refrigerator be sure to display things attractively at the front of the fridge as one of the first things you see. While it may be cost effective to buy bulk bags of apples or oranges you may find that less fruit gets eaten when you only have a few options at home versus many. Researchers have determined what is known as “sensory specific satiety” which states that our senses (such as taste, smell and even sight) get numbed and overwhelmed if they continually experience the same stimulus. This is why we eat more when there is variety. Chances are you and your family will eat more overall fruit if you put 6 or more fresh fruit (or dried) options in your fruit bowl. As frustrating as it is to still have to cut up fruit for your significant other or teenager at home, this is one of the single most important ways you can increase fruit consumption. Dr. Brian Wansink, a leading food psychology researcher found that when people cut up fruit or vegetables in a big bowl in the centre shelf of their fridge they ate 29% more! 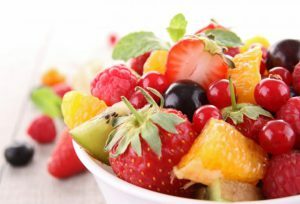 Fruit that works great to prepare ahead on a mixed platter is cantaloupe, melon, pineapple, whole strawberries, blackberries, raspberries, blueberries, grapes and more. Also consider trying what I call “yo-nut” dip which is simply plain yogurt mixed with a nut butter for a delicious creamy dip that is sure to please.